These impressive-looking and tasty timbales can be made in advance then reheated on the day. They make a great vegetarian main for Christmas Day too. Preheat the oven to 200°C, gas mark 6. Cut 4 slices, each about 5mm thick, lengthways from the centre of the aubergine. Season then brush both sides with olive oil. Place the 4 slices and the remaining aubergine pieces on a large baking tray and cook in the oven for 15 minutes until tender and browned. Transfer to a plate and set aside to cool. Return the remaining aubergine pieces to the oven and cook for a further 20 minutes until softened. Meanwhile, grease 2 x 200ml ramekins or moulds with olive oil and line each with 2 slices of roasted aubergine to form a cross. Heat a frying pan with 1 tablespoon of the oil and cook the onion for 3-4 minutes until soft. Add the garlic and cook for a further minute, stirring frequently. Set aside. Remove the aubergine from the oven and reduce the temperature to 180°C, gas mark 4. Scrape out the flesh from the aubergine shells and discard the skin. 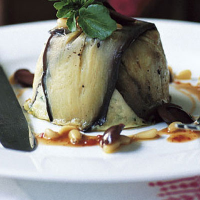 Place the aubergine pulp in a food processor with the cannellini beans, grated cheese and eggs. Season well and blend until smooth. Stir in the onion and garlic mixture together with the parsley, and pour into the lined ramekins. Place the ramekins in a small roasting tin. Pour in boiling water to come halfway up their sides. Bake in the oven for 25-30 minutes until set. Loosen by running a small knife around the edges, before turning out onto serving plates. Drizzle a tablespoon of the red pepper dressing on the plate, around the timbale, and finish with a handful of pine nuts and olives, if using. Garnish with watercress. Make ahead and freeze for up to a month. Defrost thoroughly before reheating. Heat for 15-20 minutes at 150°C, gas mark 3 until piping hot.